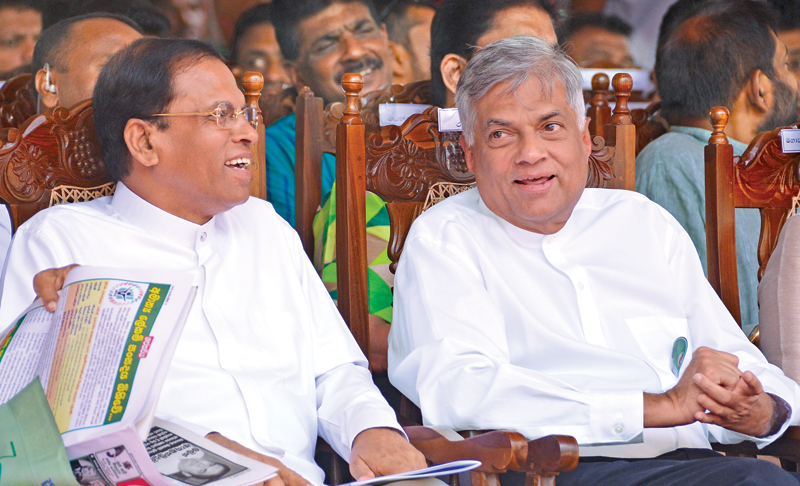 They should cut down severely on their excessive overseas visits, most of which have contributed little or no perceptible benefit to Sri Lanka and, instead, spend more time to deal constructively to stop strikes taking place. Most of all, they have to cooperate with each other and not allow anything they say or do to undermine the position of the other, however subtly such things are done. There could be nothing more advantageous to their common opponents than to see these two powerful entities back-stabbing each other whilst uncontrolled strikes continue to destroy any semblance of serious governance and economic growth. Giving in to the demands presented by one group of strikers often leads to a domino-type succession of fresh strikes called by other groups trying to get to the head of the queue. Piecemeal solutions given to strikers’ demands almost automatically sow the seeds of an unwelcome harvest of new strikes. Therefore, if one wishes to forestall the domino effect of a settlement of one group’s grievances leading to an immediate call by some other group to make corresponding enhancements of its own remuneration and benefits, it would be imperative to have a comprehensive, balanced, legally-enforceable, overall schedule of remuneration and benefits covering all employee classifications. If one’s memory is to be relied upon, about two decades ago, Tissa Devendra was appointed to head a committee that was tasked with working out an equitable system of grading and rewarding all public servants. Unfortunately, political stupidity brought this exercise to a premature halt. If the principle that all public servants are “essential” is enforced, any of them going on strike, without following clearly set out procedures for resolving whatever claims they may put forward from time to time, would be a violation of their terms of employment and a serious anti-social act for which there should be deterrent punishment. In this context, the most effective disincentive that would inhibit trade unions and other organised groups from breaking contracts irresponsibly or with an illegitimate collateral purpose would be the confiscation of property of not only the leaders of the illegally-striking unions or similar groupings but the individual strikers as well. Most specifically, any demand that is not strictly and solely related to the legitimate welfare of the strikers alone should be made a crime. In the current context, the most glaring example of a trade union that insists on blackmailing the government and the people of Sri Lanka to accommodate the political agendas of its leaders rather than the protection of the rights of its members is the Government Medical Officers’ Union (GMOA). We have, in an earlier article, equated its methods with those of the LTTE and ISIS whose principal weapon of persuasion involved putting the lives of innocent civilians in extreme peril. The GMOA’s methodology has worsened in the interim. In summary, all government employment must be considered to be “essential”. There needs to be a comparative evaluation of the degree of disruptiveness to the life of the employee that would be inherent in the many different types of jobs in government service and appropriate categorization should be worked out on the lines suggested above. An overall organisational structure and corresponding rewards should be fashioned so as to match the combination of qualifications, experience, responsibilities, working hours, job-related risks and so on to help assign suitable positions in government service to the different categories. There must be a streamlined mechanism and simple procedures to solve differences between the state and its employees without allowing any wounds to fester out of control indefinitely, especially by Ministers who procrastinate because they do not possess the skills to deal with human resources problems.